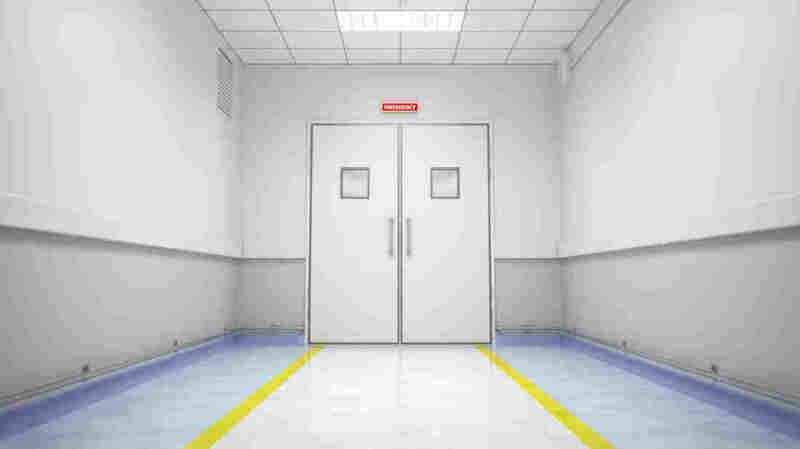 The Divide Over Involuntary Mental Health Treatment : Shots - Health News Mental health programs are getting extra attention after the killing spree in California. A law in the state lets authorities require people to get treatment. But it's not clear whether it will help. The attacks near the University of California, Santa Barbara, are renewing focus on programs aimed at requiring treatment for people who are mentally ill as a way to prevent mass shootings and other violence. In California, a 2002 law allows authorities to require outpatient mental health care for people who have been refusing it. Proponents argue that this kind of intervention could prevent violent acts. But counties within the state have been slow to adopt the legislation, and mental health professionals are divided over its effects. Do Family And Friends Know Best? The story behind Laura's Law begins in 2001. In rural Nevada County, near Lake Tahoe, 19-year-old Laura Wilcox was shot and killed by a 41-year-old man with a history of mental illness. He had walked into the county's behavioral health center and opened fire. Tom Anderson was the county's chief public defender at the time and represented the gunman in court. He recalls that the man's family had tried to alert mental health officials numerous times before the shooting. "[Officials] were declaiming privacy issues and stuff and wouldn't communicate with the family," Anderson says. "He ... started amassing guns and setting up booby traps around his house, and he had this psychosis of he was going to be attacked any minute." Now Nevada County's presiding judge, Anderson is also a vocal advocate for Laura's Law, which was passed by the state Legislature in 2002. The law allows counties to compel outpatient treatment for people whose family or friends are concerned about their mental state. It's seen as an intermediate step before someone is forced into inpatient psychiatric care. Anderson says this tool could be one way to prevent future violent incidents, including mass shootings. And, he says, the patients often respond positively. "The beauty of the program — the wonderment of it to me — is that roughly about 60 percent of the people that they do outreach to, where they go out to intervene after a person has been referred, voluntarily accept services at that time," he says. So far, only two California counties — Nevada County and Orange County — have gone forward with implementing Laura's Law. And the state hasn't allocated any funding to it. The legislation is controversial. There are concerns that involuntary treatment could make mentally ill people vulnerable to civil rights abuses. "You do have to be conscious that even though these people are mentally ill, they do have rights," says Steve Pitman, board president of the Orange County chapter of the National Alliance on Mental Illness. Pitman, whose brother dealt with mental illness for 50 years, says family members need more power to intervene and force treatment. He says they're the ones who often know what's really going on, while police or a county mental health official may have just a few minutes to drop by for a welfare check. "The problem in so many of these cases is that when they're interviewed to see if they meet those kind of threshold requirements, they don't give off any signals of being a danger to themselves or others," Pitman says. "Somebody who's experienced in these kinds of things knows all the right answers to give. They don't want to go to the hospital, so they say all the right things." That scenario echoes Elliot Rodger's alleged behavior prior to the Santa Barbara incident, in which he allegedly killed six people, then himself. But Pitman and others are cautious about linking policy changes like Laura's Law too closely to recent mass shootings. For one thing, they say, intervention cases that fall under Laura's Law may take weeks, if not months, to fully implement. And that may be too late. "I simply don't think that involuntary commitments are going to be an effective tool toward stemming mass shootings," says Jeff Deeney, a social worker in Philadelphia who writes about mental health for The Atlantic. Deeney says just a tiny fraction of mentally unstable people are a threat to public safety. "I think what we don't have that people want so desperately is the program that stops nonviolent non-offenders from committing their first violent crime because of a mental illness," he says. Deeney wants to see the conversation shift away from involuntary treatment programs like Laura's Law and toward preventive measures at high schools and college campuses.